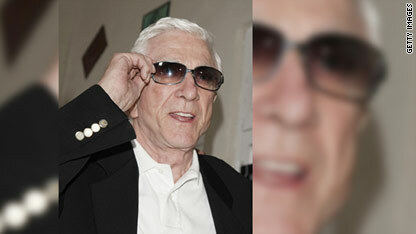 Actor Leslie Nielsen, best known for his film roles in "Airplane!" and "The Naked Gun" series, died Sunday of complications from pneumonia, his family said. Nielsen died in a hospital near his home in Fort Lauderdale, Florida, surrounded by his wife and friends. He was 84. "In lieu of flowers, the family requests donations in his name to the charity of your choice," the family said in a statement. I watch a lot of old movies and I love watching Leslie Nielsen as a leading man. He was a wonderful dramatic actor. Serious drama...his roots. Some of my greatest memories from the 80's are from watching reruns of Naked Gun and Police Academy over and over again on HBO. RIP Leslie, I hope you get to see many beavers in heaven. I'm not gonna be able to get the theme music from NAKED GUN out of my head for at least a week. That opening scene starting from the police car window is one of the best ever. I'm quite certain that Mike Myers (a fellow Canadian) AUSTIN POWERS movies big opening scenes (which got bigger and bigger for each movie) were greatly influenced by the NAKED GUN opening sequence. Youtube them both and take a look. There is only one thing to say - "he was one of the greatest if not the greatest". Rest in peace and while you are in heaven, give G-d a few laughs, he really needs them today!! One of my favorite on-screen personalities. I will really miss him. RIP Leslie. We all counting on you, and you never let us down. Heaven just got a lot funnier. We always counted on you, and you never let us down. The after life just got a whole lot funnier. "Forbidden Planet", "Airplane", "Police Squad", "Naked Gun" and so many others. He leaves a wonderful legacy and I'll always have a smile when I think of his work. R.I.P. Mr. Nielson.